CENTER LISLE, NY – Jason Barney hasn’t had the best of luck when comes to the redraw with the Lucas Oil Empire Super Sprints (ESS). The Brewerton, N.Y., driver has been stuck with the number 12 on numerous occasions already in 2016 and he was againon Saturday night at Thunder Mountain Speedway. 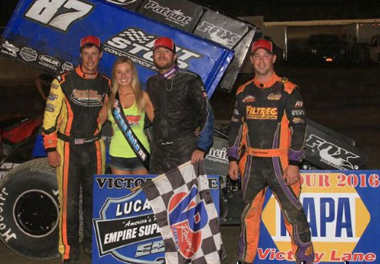 Barney wasn’t deterred as he worked the bottom of the speedway throughout the 25-lap main-event to eventually take the lead and then the win in the Lightening on the Mountain feature for a $3,750 win. It was his first of the season with club. The race was part of the overall series championship as well as the NAPA Auto Parts Tour of the US. Jonathan Preston jumped to the lead after redrawing the pole position. He beat Chis Jones into the first turn and jumped to the high-side of the speedway to secure the lead. He stayed on the top lane while Jones challenged him through the middle lane of the speedway. Preston encountered traffic on lap seven and before he had to navigate his way through the caution came out as Thomas Radivoy spun in turn four after hitting an implement tire. On the restart the red was displayed as Shawn Donath got over after doing a wheel stand. He wasn’t injured in the incident. Preston took full advantage of the single-file restart racing away from the field again. At this point Preston held the lead over Jones and Dave Axton while Barney had just made his way into the top five. Preston pulled away from Jones with Barney working the very bottom of the track to advance. Before the race reached halfway he was into the top three. Chad Miller was the final caution of the race as he got over onto his side on lap 12. After he was removed racing picked up again. Preston led the way as Barney dispatched of Jones for second on lap 13. He then focused his attention on the leader Preston. Barney, driving an X-1 Race Car, tracked him down and pulled even on lap 15 for the top spot before diving low in turn one and sliding up off the exit of turn two to secure the lead for the first time in the race. At that point Barney opened up with advantage with Preston battling with Howland for the second spot. Traffic came into play for Barney for the first time as the race reached the final five circuits. Barney’s pace was slowed which allowed Howland to inch closer to his back bumper. With only two laps to go Howland was in striking distance as Barney was forced to squeeze his way between Matt Tanner and Keith Granholm as they battle for position. He went wide into the third turn keeping Howland behind. From there Barney went on to win his 12th career Empire Super Sprint A-Main while Union Springs, N.Y., driver Bryan Howland finished second to collect $2,225. Howland adjusted his line once Barney went by and that allowed him to snag the second spot away from Preston. Preston improved upon his fifth place finish last time out with the Empire Super Sprints as he finished third after leading the just over half of the race. The Romulus, N.Y., driver has made only a handful of starts in 360 Sprint Car competition after making the jump from the 305 ranks. A pair of Canadians completed the top five as Chris Jones crossed the line in fourth with Steve Poirier moved from seventh to fifth. Car Mate Custom Built Trailers Heat wins on the night went to Howland, Axton and Barney. Parker Evans won the Cobra Coaches/Trackside Products Dash while Chuck Hebing picked up the Lacaillade Masonry B-Main victory. Lucas Oil ESS 7-12 Challenge – Barney - $100 - $100 at Utica-Rome May 29. Vahlco Wheels - Evans $190.